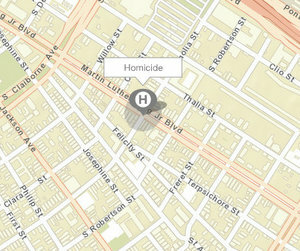 A 35-year-old man was shot to death Wednesday night on Martin Luther King Jr. Boulevard in Central City, New Orleans police said. The shooting was reported just before 10 p.m. Wednesday (Jan. 24) in the 2600 block of Martin Luther King Jr. Boulevard, near Magnolia Street, according to NOPD reports. Responding officers found the victim — later identified as 35-year-old Adam Ross — lying unresponsive on the sidewalk with a gunshot wound to the head, the report states. Ross was pronounced dead at the scene, the report states. Anyone with information is urged to call the NOPD Homicide Division at 504-658-5300 to speak to Detective Michael Poluikis, or CrimeStoppers at 822-1111 to leave an anonymous tip that could be eligible for a cash reward.